As consumers, we have become more conscious of what we eat and drink in order to maintain a healthy balanced diet. 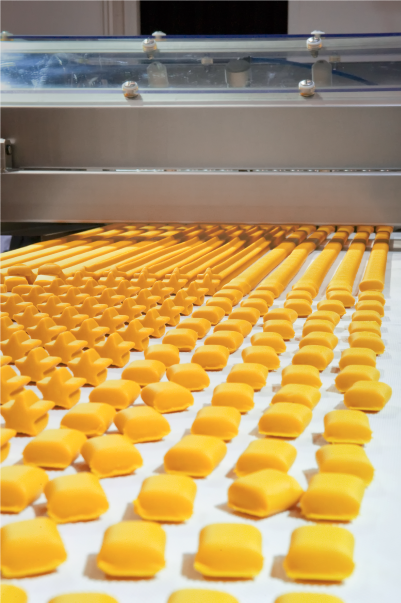 Within the food and beverage industry, responsible operators are themselves increasingly seeking higher standards of quality when it comes to the food itself as well as the associated production and packaging methods. Like any industry, lubrication is key to reliability and productivity, but it is equally important that the lubricants used in the food industry actively contribute to improving food safety standards too, hence AXEL has consistently invested in its’ capability to formulate food grade lubricants that deliver equipment protection whilst ensuring compliance with relevant industry regulations. AXEL's range of high performance, H1 approved food grade lubricants provide suitable lubrication solutions for your HACCP processes whilst enabling reduced maintenance costs and increased production efficiency for operators across beverage, dairy, bakery and other food industries. Due to the variety of processes within the food and beverage industry, AXEL has developed a comprehensive food grade range featuring both greases and oils enabling the protection of a wide range of equipment from hydraulic pumps and compressors to gears, chains and bearings whilst also complying with the requirements of all industry related legislation. In addition, AXEL's ISO 21469 Certification offers product and quality assurance across its’ entire manufacturing process.